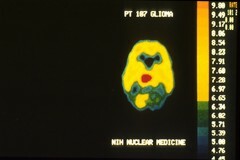 A PET scan of a malignant brain tumor. This PET scan depicts a highly malignant brain tumor. It appears red because the tumor uses more glucose than the normal brain.